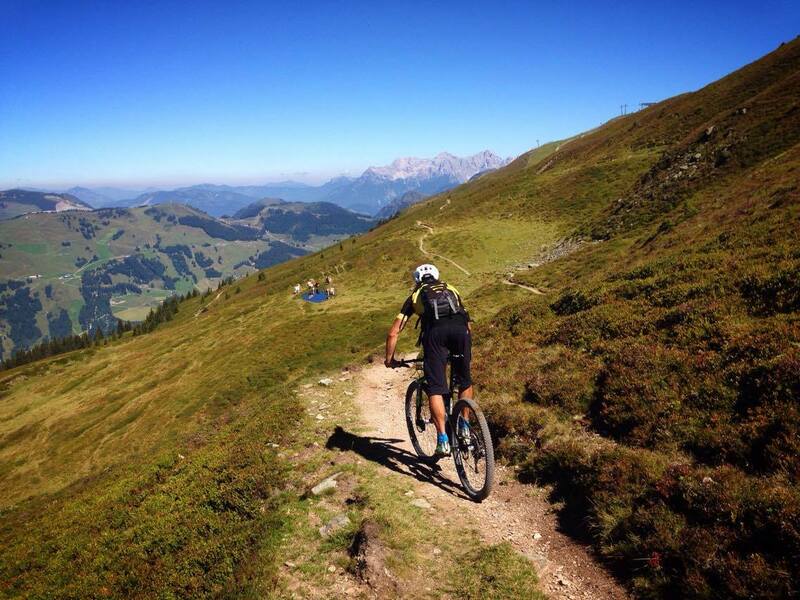 For mountain-bikers throughout Europe the Alps have always been a “must-do”, and even those who can’t afford to go there every weekend still schedule at least one epic bike ride every season. Those of you who still haven’t had the chance to ride over the alpine trails, over forest trails that often make you wish you’d brought your ice pick along, over freeride tracks perfectly built and maintained, or over alpine plains where you inevitably run into some grumpy old man whose temper snaps quicker than you can say hello, and who gets mad at you because you and your bike have the nerve to erode his soil, well, it’s not worth trying to imagine it. Nor can you know what it feels like to spend 2 to 3 hours on an arduous climb, only to enjoy a 45 minutes descent with no breaks over a trail that takes you back into the deep valleys cutting their way through the Alps every which way. Under the watchful eye of the towering glaciers nearby, standing guard over everything that lives at their feet thousands of feet below, and surrounded by thundering waterfalls that hurl millions of tons of water into their rocky walls and by plains overgrown with the greenest grass in the world, home to gentle cows that have never known what it means to fear bears or wolves. The latter have been hunted down to the last pup and are now mere trophies on the walls of wooden cabins, hundreds of years old, breathing alpine history, and standing still in the face of time. 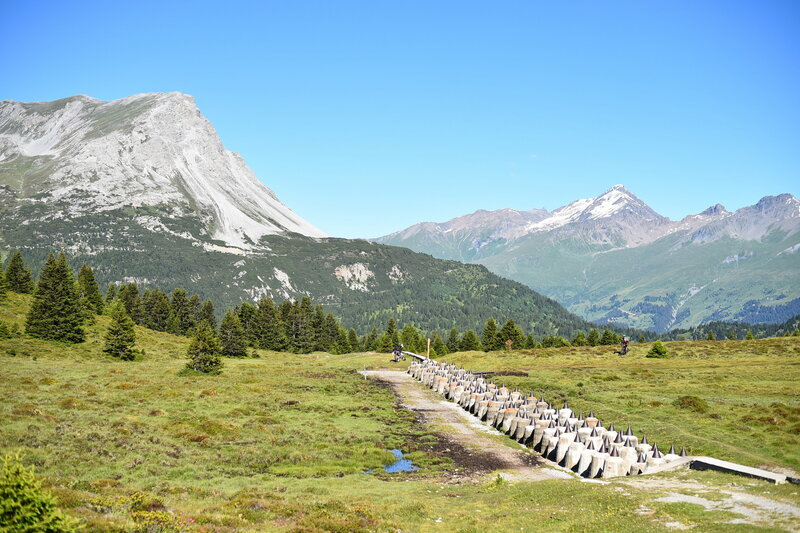 Exploring the Alps is like travelling into the future, allowing you to discover wonderful things, but also to encounter mementos of dark moments from recent history, a mix of old and new, of western civilization and fresh nature, although it has somehow lost some of its initial untouched appeal. So what lies behind the Pannonian Plain in the eyes of a mountain-biker looking for adventure, for a solid workout, for steep and dangerous mountain slopes, for endless trails you have to earn, and, most importantly, in the eyes of the athlete looking to gain basic respect from his fellow bikers who are less fascinated by this sport? It’s Disneyland, or it’s Neverland, or maybe it’s the Jurassic Park. A Disneyland that comes with its own set of rules, established and followed by the rest of mountain-biking enthusiasts. Rules which, for someone coming from the East of Europe, may appear as restrictive and a significant interference with freedom of movement, freedom to explore the surrounding nature. However, I’m not here to reflect on these aspects – I might do it at a later date, but not now. 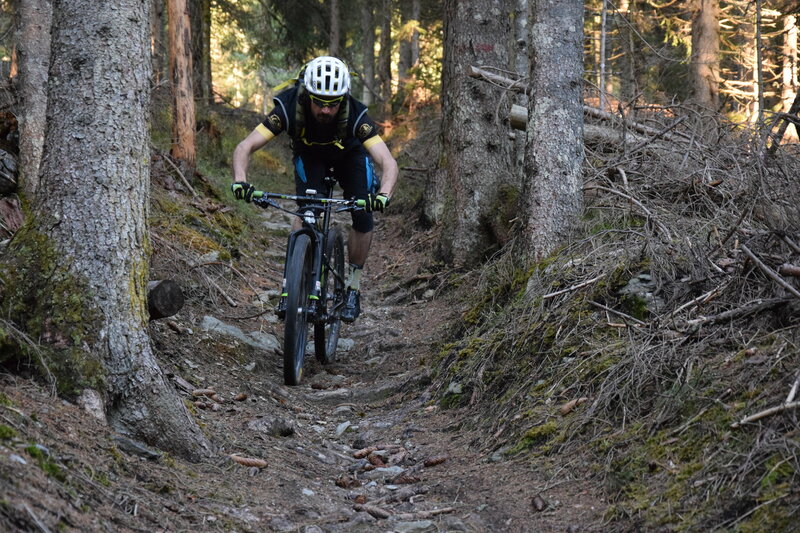 I am here to tell you about the wide variety of mountain-biking trails and tracks that make you feel perfectly in your element, leaving you with the sole difficulty of deciding where you want to go first. 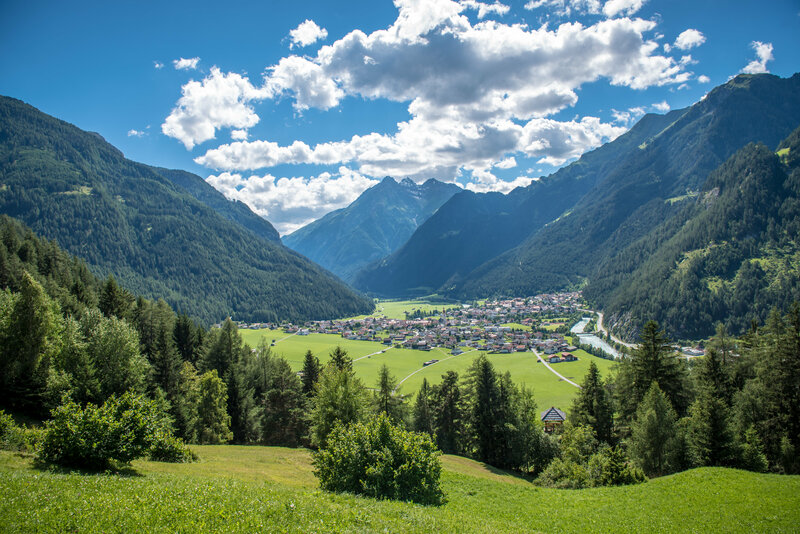 And because we enjoy exploring and getting a feel for this element in every part of the world, we recently had the chance to uncover yet another corner of the Austrian Alps. How hard can it actually be to get to know an area once you’ve put together all your maps, GPS tracks and information available from the Internet? Should be a walk in the park… right? A first search returns a list of tracks. You start with the ones that are properly marked, then you give a look to those created by other mountain-bikers and, through careful observation of the contour lines, of the rivers, valleys, and peaks, which you check against the images that are imprinted in your mind, you start to gradually get an idea about your surroundings. My problem, or perhaps my luck, is that I always want to start by exploring the most extreme possibilities. I want to see if and how I can get from that really deep valley to that really high peak. To check whether I can connect one long and steep climb to another long and steep climb, without shaving off half of the lugs on my tires by riding on asphalt roads. 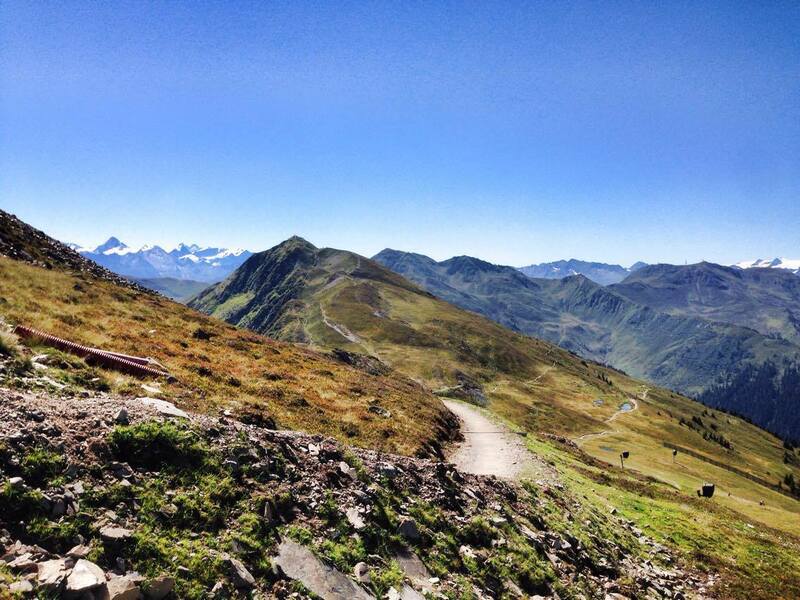 And, if at all possible, somewhere between those two high peaks, I’d also like to find a trail that’s technical enough to keep me on my toes, long enough and without any sections so exposed as to make me feel I might be risking my life by riding them alone. I wouldn’t want you to think that the tracks that are properly marked lack excitement. They are very exciting. But even so, you find yourself irresistibly attracted to the trail you see meandering on the opposite slope. The one that is forbidden and apparently dangerous. And you see it each time you ride the officially marked trail. It just sits there and you seem to be the only one who hears its calling. Eventually, enough is enough – you need to check it up close. Still, while you’re there, you might as well go see a few other places too. And that is how you end up planning long and epic rides. So long and so epic that, more often than not, they go beyond everything you might have imagined. In preparation for the ride, you spend a few solid hours poring over maps before you pack up your things and go. And everything goes well, the climb is absolutely awesome, the effort makes you feel good, the view makes you want to cry, the wind howling on the peaks stirs such sensations that you end up covered in goose-bumps. The descent doesn’t even matter anymore. You just go with the flow, enjoy it to the fullest, forgetting about everything else and living in the moment. You don’t take risks because you don’t have backup, but you’re not exactly cautious either… not at all. Eventually you reach that place that even the map marked as unfriendly, a description confirmed by available satellite images, by what others have told you and by what your own intuition has told you. If this was Romania, you could expect anything. A really grumpy bear, a pack of shepherd dogs, “user-friendly” wood cutters, and everything else in between. This is Austria, though, and all you’re looking at is a crappy precipice and a complete dead-end. And you start looking for back-up options, you think long and hard, racking your brain for ideas, but to no avail. You sit down, open your backpack, forget for a moment that you’re only a few feet away from thin air, and you start eating something. You listen to the howl of the wind and you let your eyes wander over the endless variety of colors in front of you. If you were sleepy, you would fall asleep on the spot. But a weird feeling keeps you alert, a need to be some place safer; it’s a mixture of a little panic and a little urgency. You take a few deep breaths and are hit by the realization that you’ll have to retrace your steps – you are looking at pushing your bike on a climb totaling 800 m of elevation. Your only company on that climb is a bike that’s way too expensive… and, undoubtedly, a few saints and holly names you always keep handy for invoking whenever your carefully planned rides stumble into the obstacles reality has in store for you. By the time you finish climbing, you’re almost ready to drop with exhaustion, but you recover some of your alertness as you awkwardly descend the track you had climbed earlier that day. Could it be this was a failed ride? When you get home, you’re exhausted but happy, so you help yourself to some beer. You decide you couldn’t care less about stretching, about recovery shakes and massages. You remind yourself that you enjoyed the segment before the climb, and that the climb itself was as cool as it gets, much like the descent that followed. Unfortunately, this was the first and last time you’ve ever ridden that particular route. There is absolutely no way you can connect it to anything else and you can’t use any part of the awesome track you’ve just explored. It was an experience like many others, except each of them has something that makes them unique. And this is just one of the dilemmas you encounter when you’re looking for new tracks, no matter where you are. Usually you come across fabulous segments, incredible even, but, for reasons as described above, they remain a unique and never-to-be repeated experiences on a shelf full of such exploration attempts. So was this a failed ride? I saw it rather as a unique ride, a mix of effort, pleasure, disappointment, and exhaustion, a sea of conflicting feelings lived over a short period of time. It was merely a brief sample of the adventures life as a mountain-biker has to offer, the life of the rider who enjoys climbing and descending, pushing his bike, laughing and crying, all of which he does willingly and without virtual viewers. So why did I call it Disneyland? Because all the things that otherwise would make you nervous, you find them in Disneyland set up so as to provide the most fun possible, while keeping you firmly under your safety belt… at least as long as you stick with the properly marked routes. Whatever happens once you step into the unknown becomes unpredictable and, as a consequence, much more intense. 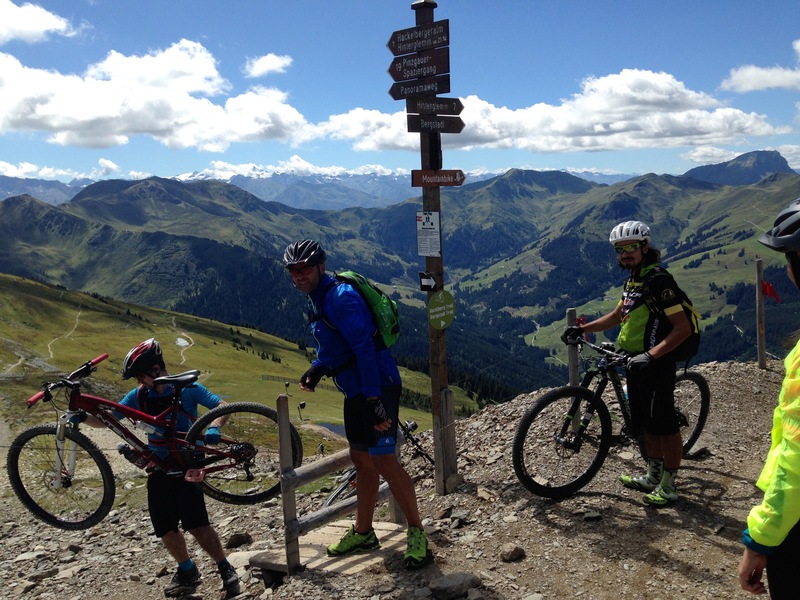 And if you want to join us and ride along on some of the routes we have discovered so far just a few steps from home, you’ll have a chance to do so at the Rock the Alps camp between September 2nd and September 9th 2017. Where else but in Austria, of course? !